A floral-gourmand, Mademoiselle Rochas embraces the brand’s original philosophy – ‘audacity, youth and Parisian elegance’ – but adds a playful flirtiness to the mix. 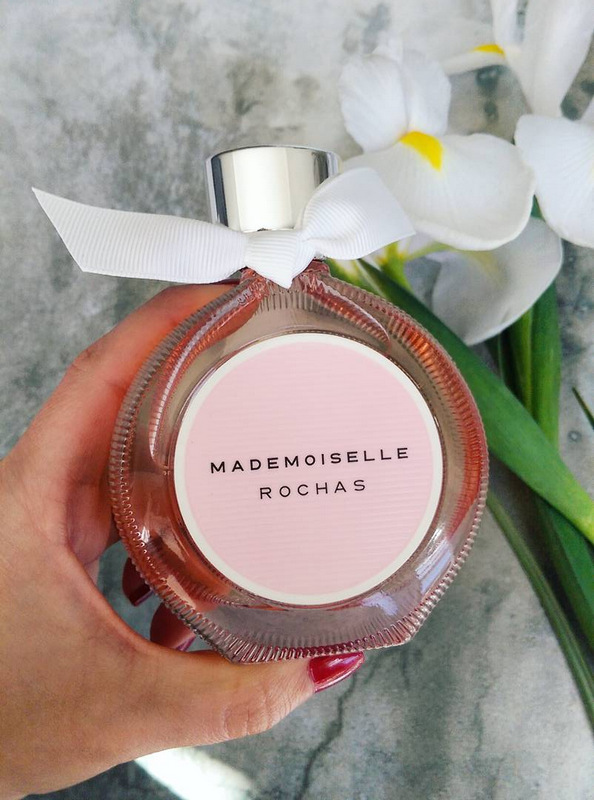 The Mademoiselle Rochas wearer is a spontaneous, fun-loving girl who’s always on the go. She will, however, always make time for her friends and is admired for her cheerful, happy heart and effortless sense of style. Notes-wise, you’re looking at candied apple and blackcurrant up top with a heart full of rose and Egyptian jasmine on a bed of sandalwood, musk and ambergis. On me, the candied apple comes through loud and clear and I like that it smells like a pink lollipop as opposed to toffee. It’s definitely more ‘candied apple’ than ‘toffee apple’, if that makes sense. The rose soon sweeps in but it’s a lush, green version that tempers the sweet opening and then you end up with warm, sheer musk dry down given a glow from residual sugar. While it’s definitely a youthful fragrance I do think that anyone who’s young at heart and appreciates a sugary gourmand like Lancome La Vie est Belle or Angel Eau Sucree (remember that?) is going to fall in love with it. It’s a lovely day time scent for spring when you’re heading off to do something fun with your girl friends. 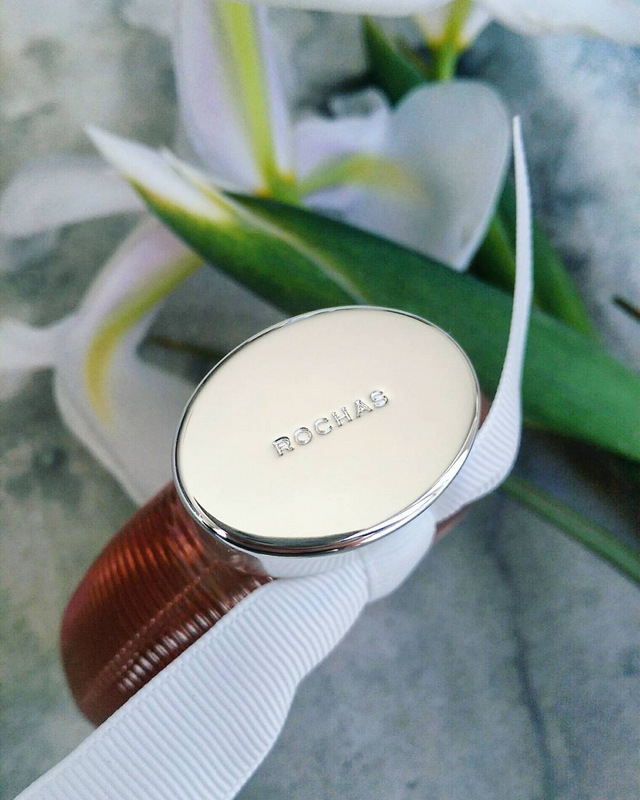 I also love the white ribbon around the cap – a Rochas signature – that gives it an elegant little finish. This is the same ribbon Rochas sews into all their coats. This competition is open to South African residents only and a winner will be drawn at 5pm on 19 October 2017. This competition is now closed. A big congrats to winner Jennifer Perumal. I’d start with a Parisian breakfast, then off to the Place de la Concorde, Champs-Elysées, for an amazing views of the Eiffel Tower, the Seine and the Arc de Triumph. Cross the Royal Bridge to enter the Garden of the Tuileries and admire the Louvre. Breakfast at a small coffee shop on the street, thereafter trip to the Eiffel Tower! I will top it off with some shopping! I would visit literally every store, try on clothes I could never afford and take countless pictures in them. If I have time, I may or may not look for a French husband. Morning walk at the Elysèe Palace Gardens an extended walk to Cafè Blanc enjoying the beautiful spring flowers everything just blooms in spring. While enjoying a Breakfast Classique at Cafè Blanc my thoughts will reminisce on their pre-war decor…that is France in Spring. Viewing the city by doing a river cruise and then having an espresso and a macaroon at a small coffee shop Parisian style! DREAMING!!! I would wake up really early to fit as much as possible in. Museums and eating would be in the agenda. First stop coffee and a croissant at a little side walk cafe and then onto the Louvre. I’ve always been a fan of Rochas, I have worn Byzance by Rochas for many years. A perfect day in Paris would include visiting all the usual top tourist attractions since I haven’t been there yet. My must see fave places are the Luxembourg Gardens and Chateau de Versailles. My brother lived there for 2 years and he is going back next year, hopefully he can be my tour guide. On a sunny spring day in Paris, I would purchase a baguette and french cheeses and head to the Sacre Chaur, sit on the steps and take it all in. Shopping, site seeing and a romantic picnic. A stroll through the streets stopping for coffee and croissants. croissants and coffee in the Latin Quarter followed by gallery hopping, cheese eating, wine drinking afternoon! Gosh I would have to say chocolate croissants and coffee at an adorable cafe, shopping and do I have to sightsee??? I suppose if I had to then a trip upbthe Eiffel Tower would be on the menu! And then I would soak up some more of Paris by doing lots more shopping! Hello I was in Paris in last week… and I did the following: Breakfast in a super cute brasserie, visit of the Christian Dior expo, lunch at Ladurée and visit of the Galeries Lafayettes…….with 2 super girlfriends!!!! I would see the sights of Paris on a river cruise aboard the La Marina de Paris glass-enclosed boat, passing landmarks such as the Eiffel Tower, Louvre, and Notre-Dam while feasting on a three course meal eeeeeee so exciting! Sitting at a table in a cobblestone street, sitting some wine and eating a delightfully french snack! Definitely start with a full parisian brunch. Then a lazy stroll through the fashion streets. Shop till I drop. Delicious lunch while i rest my feet. & to end off, a lazy boat cruise……dinner while the sun sets. I would sit at a sidewalk cafe having copious amounts of coffee and watching people. Take in the beauty of Paris and elegance of French women and of course, do lots of shopping! A spring day in Paris? I would get on the train that takes me directly into Disneyland Paris 🙂 I would spend the day eating Mickey Mouse shaped Brioches, massive candyflosses and all those yummy Disney treats! I would go on all the rides (except It’s A Small World YUK). I would take pics with all my fav Disney men like Flynn Rider and Aladdin and Christoff 🙂 I would end the day watching the epic fireworks display with a glass of French Champagne toasting to my version of the best day EVER! I would visit The Notre Dame Cathedral Paris (Notre Dame de Par) & take a trip down the Seine River. I would watch the world go by over un café (a coffee) or early evening apéro (pre-meal drink) on one of the city’s zillions of cafe pavement terraces – there is no finer time of year to indulge in Parisian cafe culture than spring as outdoor heaters are put away and tables multiply. Firstly I’d stuff my face with the best croissants I could find, whilst drinking coffee and watching the beautiful and very chic people of Paris stroll past. After that I’d want to shop until I drop in the most beautiful shops I could find. I’d try and fit in a stroll through one of the many beautiful parks there and after that it should be dinner time and there is bound to be a fabulous restaurant nearby for me to enjoy some delicious food. Brunch at a street side cafe, chocolate croissants and the best champagne, then hit all the French designer shops. Balmain, YSL, Christian Dior and Chanel. Have lunch then visit Château de Versailles. I would end my day eating macaroons at the Eiffel tower. I would have coffee and croissants foe breakfast and some quaint street cafe then stroll the streets hand in hand with my loved 1 thereafter heading off to the shops. Lunch would probably be a light snack of pastries from some yummy pattersrie before heading off to get some cheese, French bread and drinks to spend the afternoon watching the sunset behind tge Eiffel Tower. A beautiful day indeed. I would start with a cappuccino and an almond croissant, followed by stocking up on my favourite French drugstore brand, Bioderma, then people-watching and learning from French girls! It may sound strange, but I’d just like to have a slow stroll with a coffee in hand…with all the time in the world! A day in Paris- croissant and cheese laden breakfast, walking the streets to soak in the culture, a charcuterie platter for two at Le Trumilou, followed by tea at the Louvre, then pass out on my bed only to wake up to order room service- fries and champagne to eat from my balcony. I would definitely shop till I drop and try out the pastries and cheeses and chocolates and coffees. Also not to mention seeing the Eiffel tower and maybe taking a ferry trip of some sort. I would eat *ALL* the delicious baked goods,take a stroll to a corner cafe and have a long lazy wine filled lunch, see some art works and indulge in some shopping of the fancy “made in Paris” variety. I’ll go for a walk in Le Jardin du Luxembourg and then have a coffee at a nice bistro and watch the passersby. Next i’ll go browse the oldest market in Paris – Marché d’Aligre. A great end to the day would be to watch a cabaret show at the Moulin Rouge. I would love to walk the streets with a map and simply get a feel for Paris whilst seeing all the must sees that I could in a day of walking. A sunny Spring day is just the perfect way to do that. That is the way I love to get to know a new place, getting a little lost along the way is part of the appeal and good weather is the only way to do it! Enjoy a chocolate croissant and a coffee with a friend then to walk through parts of the city, perhaps browse through an outdoor market..
1. Fill my belly with all their delicious foods! 2. Bask in the sun in Paris’s most famous garden. 3. Shop till I drop! You’re in Paris, after all! I would take a leisurely walk along the river Seine with my husband, stopping off here and there for some wine & tapas. I’d spend my sunny day in Paris with my husband having a picnic at the Jardin du Luxembourg. Lazing in the green chairs, watching Parisians going about the chic lives, munching on mounds of french cheese and pain au chocolat before making my way towards the Champs Elysees for an EPIC shopping spree. Rolling out of bed, sauntering a few doors down to the local boulangerie and retreating with freshly baked croissants to the privacy of my own balcony. Tackle sightseeing with a hop-on-hop-off bus tour, and then treat yourself to heavenly bakeries and patisseries – relish Ladurée, and pick up a box of their famous macarons for later – LOVE the rose-petal flavour. Savour some time window shopping at the magnificent Printemps and Lafayette. Bliss and incredibly beautiful! I would love to go to the top of the Eiffel Tower… then go to a local patisserie and get myself authentic french croissants, macarons and whatever other yummy french goodies available, pack a lovely picnic and enjoy it with my hubby near the Eiffel tower… Followed by a shopping spree on Champs Elysees! We got engaged on Eiffel tower 10 years ago so I would most defintely like to go back up and reminisce and see if we can catch someone else getting engaged so we can take their photos like a couple who were celebrating their anniversary did for us! They took a photo of my husband on his knees proposing! Champagne, shopping and visiting a street café while people-watching (or I guess in France it will be indulging in the grace and flair of french women). End the day with champagne!